The traditional Catholic prayer before meals can sometimes get a little lost on us in its ritual nature, as the Old English terminology had for my sister when she was younger. My own prayer before meals can often be hurried in my busy day-to day-life and even at times apathetic, as if I were actually praying “and these, I guess”. 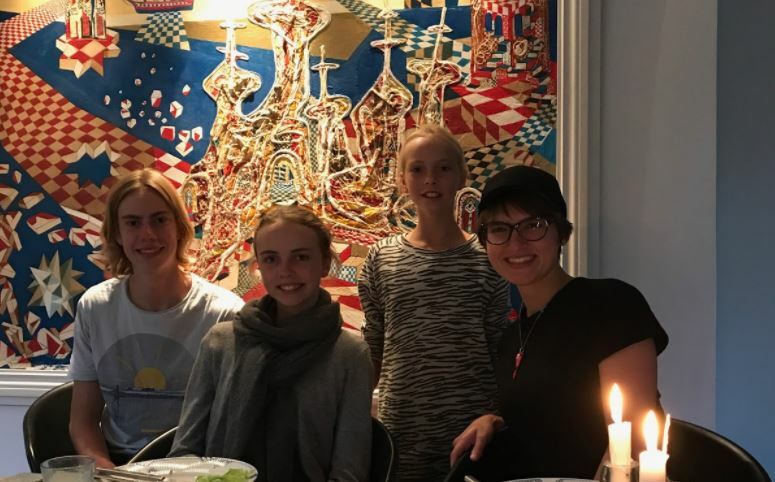 Recently, though, I was given the opportunity to be drawn out of the ritual motions and words of the prayer at the dinner table in Rungsted Kyst, Denmark. 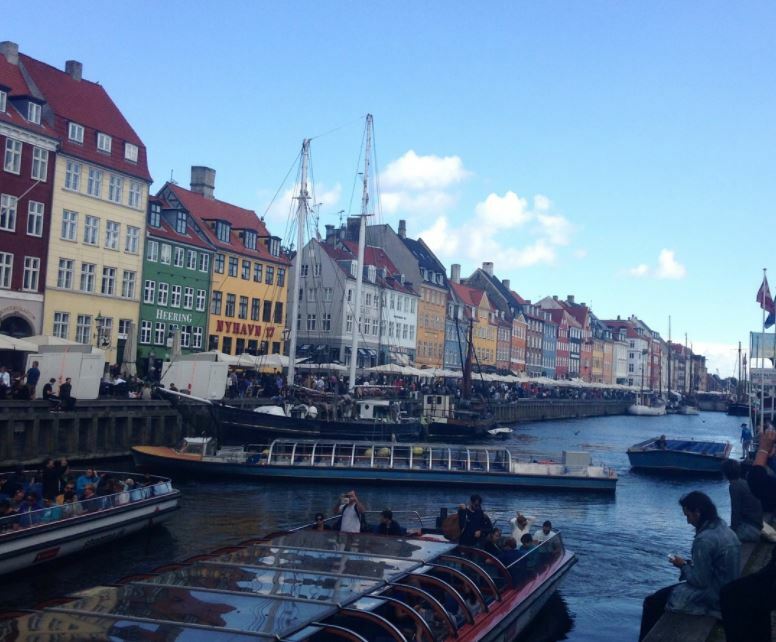 This past semester I lived with a wonderful host family in the small coastal suburb of the capital, Copenhagen. My family included several host siblings: 10 and 14 year old sisters (Amalie and Victoria), 17 year old brother (Gustav) and, arguably my favorite, the small dog (Luna). One of my favorite parts of living with them was our hyggeligt nightly family dinner. 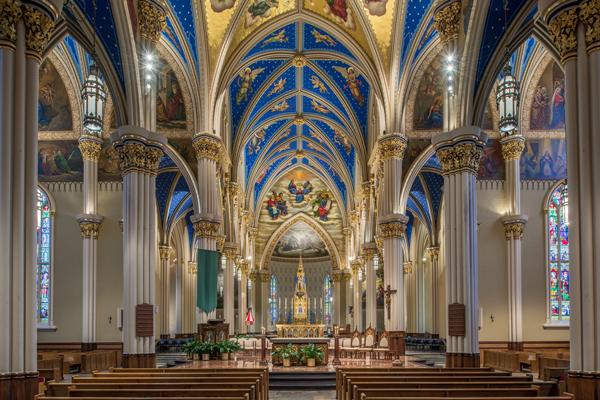 I was used to praying before meals, as I had always been taught to by my family, and it was something that I had continued to do at Notre Dame. My host family, though Christian, were not particularly religious and did not pray before meals. Being a guest in their house, I did not want to seem overly religious and make them uncomfortable, so I snuck in my prayer before our dinners while no one was looking. My secretive prayers continued for some time until my youngest host sister, Amalie, noticed and asked my host mom what I was doing, though she said it in Danish. 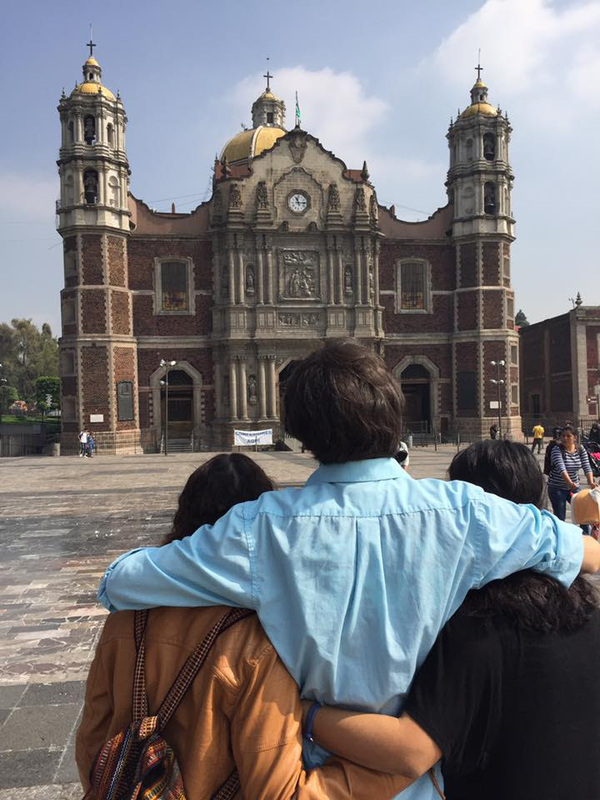 My host mom asked me if I was in fact praying, laughing a bit at my shyness, and was surprised that so much time had passed with no one having noticed. After my host family found out that I always prayed before meals they would pause in serving the food when they saw me begin to make the sign of the cross. It was occasionally rather uncomfortable, as they stared at me in a bit of wonder and waited to continue what they were doing until I was done. I was happy, though, that I no longer had to sneak in my prayer and it really made me stop and think about the prayer I was saying, as well as make sure I remembered to pray it. Nearing my last week with my host family in December, after I finished praying, Gustav asked me why I prayed before meals. I hadn’t realized what a mysterious thing prayer could be to someone who had never really experienced it in this way, as it had always been a part of my mealtime ritual. I told him that it was an act of thanksgiving. It was a recognition that I am blessed to have the meal sitting before me as well as the family surrounding me. In praying I am showing gratitude for all those whose labor went into the food reaching my plate while also praying that those who were not as lucky as me would be fed. Gustav’s response struck me in his immediate acceptance, as he said that he thought the whole family should begin to pray before meals along with me if that is what it meant. I, like I think many Christians do, heard about missionaries converting people in foreign lands and had a longing to go out into the world and do these awesome deeds, but I hadn’t realized that in praying before meals in the tiny suburb of Copenhagen, Denmark, I truly was a missionary. Although I did not directly preach the words of the Gospels or bring my host family to Mass with me, in modeling a way that faith had moved me to reconsider a part of my daily life, the meal, I believe that I was able to show how my faith is one of gratitude and thanksgiving. I realize now, though, that I left out an important part in my description of my prayer- that I was also praying with the gratitude for the space to be able to show my faith and for having been raised in a family and community that taught me the very faith I was able to demonstrate. 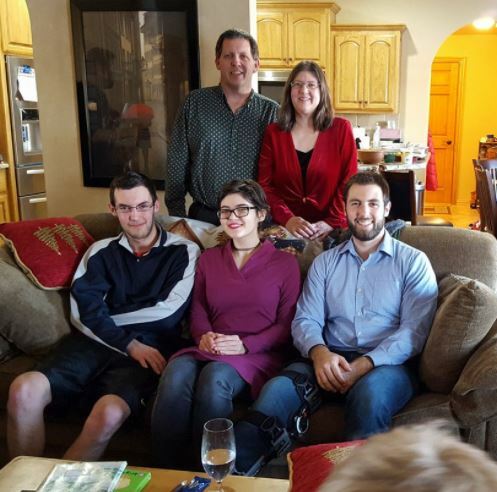 I regret not having been more upfront about my faith from the beginning to my host family, as I might have been able to have the conversation about prayer and more with my host brother long before the eve of my departure. I don’t think that I will ever fully be able to see my mealtime prayer without this new lens of mission and purposeful gratitude, and I hope I continue to often find myself sitting at a dinner table with the choice to pray in secret or to profess my faith so that I do not forget the great blessing that is prayer. Bless us, O Lord, and these thy gifts which we continue to receive, from thy bounty, through Christ, our Lord. Amen. The worst place to have a panic attack might be in the middle of Mass. While I am praising the Lord’s name and listening to his word, my anxiety sits in the pit of my stomach, making me feel like I am at the edge of a cliff. I know that I am safe here in the Lord’s house; I know that God loves me, yet my body and my emotions are convinced that the world is crashing down around me as my hands start to shake and my breath catches in my throat. Forcing myself to take a deep breath, I try to focus on the things I know to be true: I am safe, I am loved, I am breathing, I am sitting in Mass, I will be ok. I continue to repeat these thoughts until the anxiety that was creeping up the back of my neck recedes and I feel normal again. Generalized anxiety is a mental disorder that is characterized by excessive worrying about a number of things. The worry is out of proportion to the impact of the events that are causing it. This means that something as small as wondering if my friend had a good time when we went out can cause me to physically panic with worry that I failed them unless I was personally ensured that they enjoyed themselves. 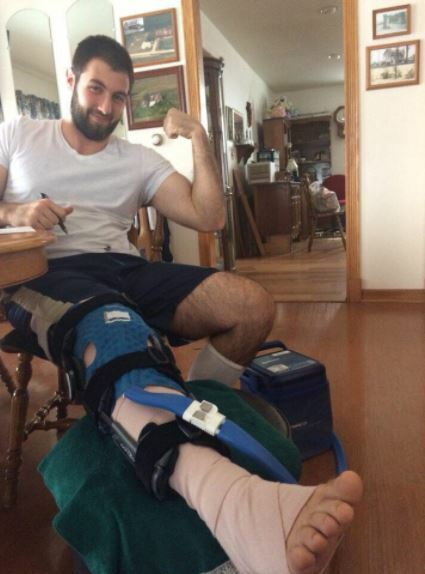 My emotional response to everyday situations can be over-the-top and physically painful. But through my faith in God, I can always find ways to cope with the gap between what is truly happening and my emotional response. My faith acts as a bridge connecting how I feel to my belief in God and His plan for me. 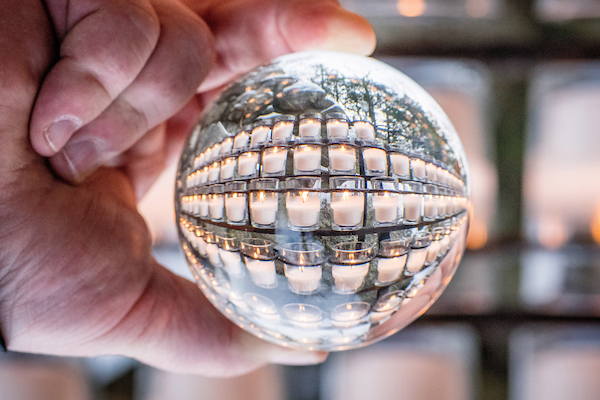 Grotto candles refracted in a crystal ball. My worth comes from God. My worth cannot be diminished by anyone but God. My worth to God does not change because I made a mistake. I am not any less loved by God because I made a mistake. By focusing on God’s love for me and the worth his love gives me, I can begin to slow down my breathing and my thoughts. Taking deeper and deeper breaths, I begin to focus on the truth of my situation, whatever they may be. Whether I got a bad grade, or embarrassed myself in front of the class, or simply felt overwhelmed by the amount of work I must get done, I can now start to look at it for what it is: a situation that I can handle with God’s love to strengthen me. This knowledge does not always mean that the feeling of panic goes away. My body may still feel as if I am being physically attacked, even though mentally I know everything is fine. My heart may still be beating fast, my stomach may still be in knots, and my hands may still be shaking. By focusing on God, my faith keeps me on the bridge between how I physically feel and the truth of the situation. Faith is my bridge between anxiety and reality. This is a little exercise that my Compass group did my freshman year, way back in 2014. Each week, we would start our meetings by sharing some highlights and lowlights about that week and by answering the question “Where have I seen God?” This was my favorite part. Now a Senior, I remember this exercise because it left an impact on my spiritual life. When I first heard it, I saw it as a challenge to look for God in every encounter and every moment, especially since I wanted to have something to share at the beginning of each Compass meeting. I thought it was nice, because I was constantly reminded that God is with me and found comfort that His presence can be made known, even in unexpected ways. What was great about this retrospective question was that for me, it was a practice that involved appreciating God’s will and presence in every moment of my life. 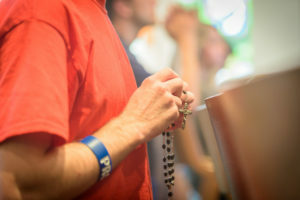 It became a habit to find God at times and places that people wouldn’t normally think of, as in not just at the Grotto, in a chapel, or at Mass. 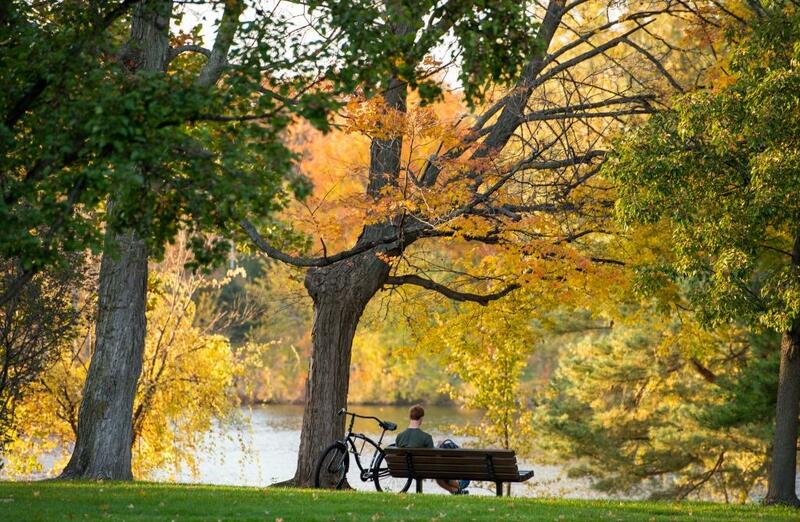 I found myself recognizing God in my walks to class through God Quad, in the laughter that I shared with my friends, and in the multiple instances of admiring nature. It was in these small moments that I was able to turn to God, become attentive to Him, and give Him thanks for the many blessings in my life. He felt more real and I felt my spirituality and faith growing. Now, it has been about three years since I was in that Compass group, and every now and then, I’d have little moments that remind me of that challenge I once had. I now feel like I have lost the habit of being mindful of God. I say grace before my meals, I give thanks at Mass, and I pray. But, I feel like I am no longer as attentive as I used to be. Somewhere along the way I’ve forgotten this habit and find myself needing to focus on getting through my responsibilities, especially when I’m having difficult days. 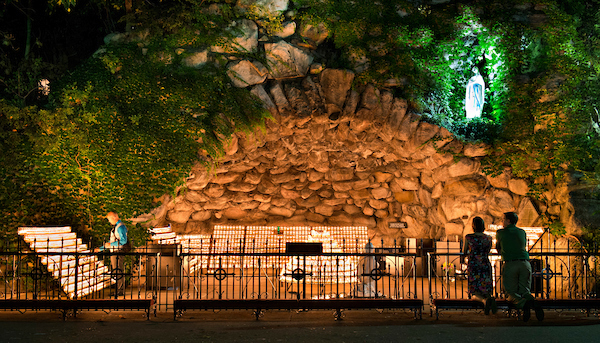 The Grotto is a special place of prayer for many students. However, God surprises me by making His presence known, even when I’m not being attentive. One example is a day that I wasn’t feeling myself and I decided to go out for a walk. I didn’t expect to run into anyone or have anything in particular happen. I just ventured out to roam around and clear my head of the lonely sensation that I was beginning to feel. I decided to make my way to the Grotto and randomly met a friend whom I hadn’t talked to in a while. It was nice running into her and having the opportunity to chat for a bit, especially because of how I was feeling. After we parted ways, I thought about this accidental encounter. It felt like a purposeful encounter of God’s love, for it was an unexpected moment where I was reminded that I am not alone. I felt God near even in the midst of loneliness. The reality is that God is always present, regardless of whether or not I am attentive to Him. Even if I am not aware, He is there, ready to receive my attention when I turn towards Him even if it is just for a single moment in my day. Realizing this, I hope that can be more mindful of God, become closer to Him, and grow in my faith. Both satisfied in my silent reproach of God and defeated that I had come to that point, I genuflected and exited the church. It wasn’t my finest moment of trust in God’s providence and grace. It was, however, one of the most honest moments of prayer I’ve ever experienced. Before then, I believed that giving my intentions over to God would feel good-natured and graceful, easy to do with answers to follow quickly. I was wrong: it felt more like exhaustion from running out of other options. The answer to why I minister is rooted in my experience of prayer. I try to be a faithful disciple, and I hope to help our students do the same, to grow in faith here at Notre Dame and far beyond. Specifically, my ministry is to help our students to pray well together, and there’s a phrase I use to describe this work: serious joy. 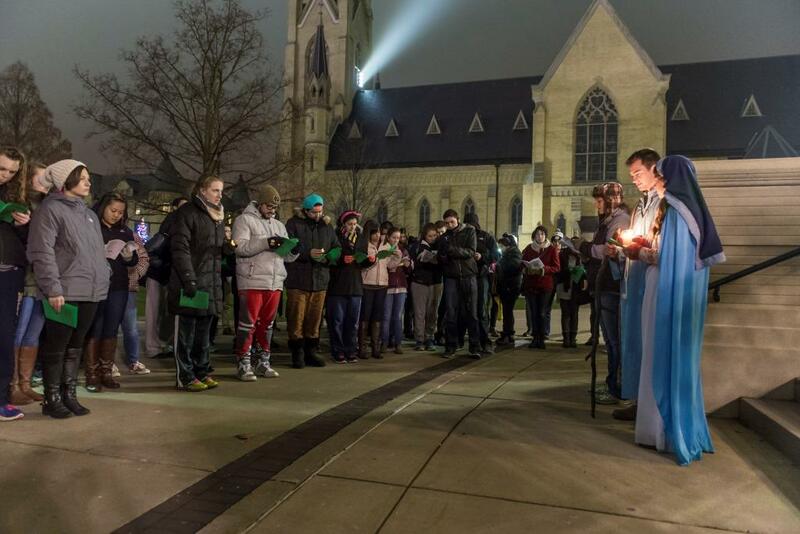 It’s serious because this ministry is no small task: to teach students how to pray and how to lead communal prayer, to offer formation as they plan Masses and prayer services, and to encourage them to grow in their faith long after they leave Notre Dame. At the same time, this ministry is abundantly joyful. I’m privileged to see what happens when students — while praying together — encounter God. I hear them give reflections on Scripture and listen as their words bring new light to old passages. I watch as students give their time, energy, and boundless courage to lead music during their hall’s Sunday Masses. I see their heads bowed, eyes lifted, hands folded, hugs of peace, and other postures and gestures of prayer expressed. 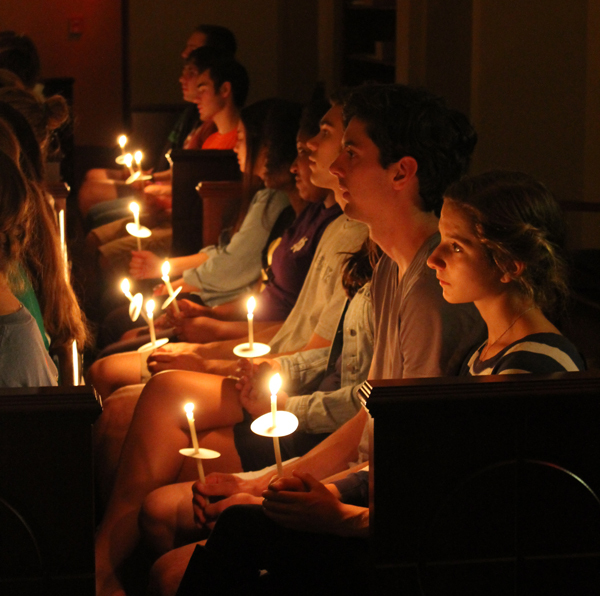 It’s a true joy to pray with, for, and among our students. I have a personal investment in working with students to plan liturgies because it was in the Mass that God and I first found each other. 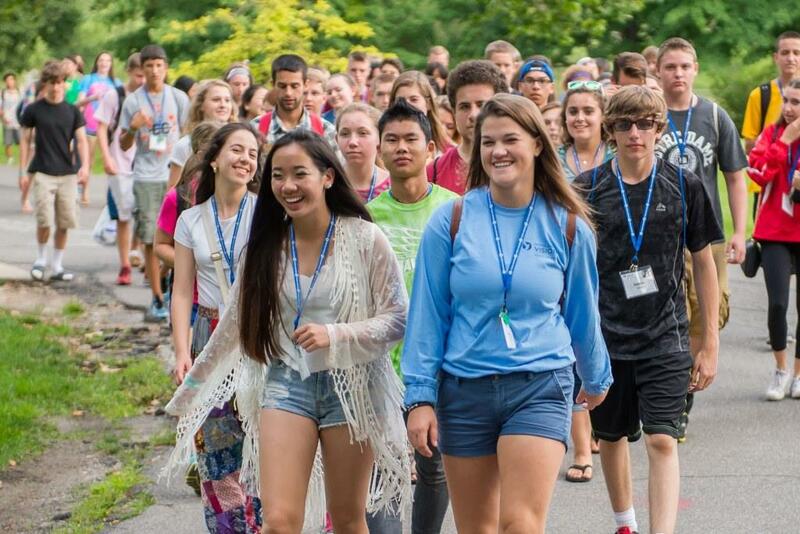 In effort to grow in faith, I’d gone on service trips, attended many retreats, and prayed with Scripture; however, it was in Mass that I first encountered God and that encounter is what compelled me to return. 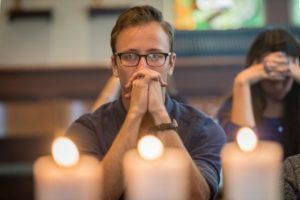 At different points in my life, I’ve found great comfort at Mass — even if I’m distracted, even if I don’t know the songs, and even if I only caught the opening line of a homily before my mind raced in another direction. I have strong memories of events that took place in the context of Mass, some monumental and some rather routine: I’ve witnessed my college friends become ordained priests, and received chrism oil on my forehead at Confirmation; I’ve run straight from the lake to church on a summer Saturday, and celebrated the beautiful sacrament of my sister’s wedding. Like my prayer, Mass takes different forms and shapes, but it is a constant in my life. Mass was both fifteen-minutes before starting my high school day and the three-hour Vigil on the night before Easter. Mass sounds like a packed residence hall chapel of women’s voices and like echoing silence after communion in a French cathedral. Truthfully, going to Mass doesn’t always feel like the most thrilling activity in which I participate. I can’t compare it to rollerblading, kayaking, or watching Notre Dame football. But I don’t go to Mass because it’s always thrilling. I go to Mass to meet God there, again and again. And I keep going back because of what the liturgy compels me to do after: to be God’s hands, feet, voice, and love in the world. I’m grateful for this ministry in helping students to pray well together. I hope that they will always want to return to God in different moments of prayer, as I do, and never to be far from that encounter. About a month later, I felt overwhelming gratitude when I received an answer to my despairing, wintry-day prayer. So I returned to that same pew in the Basilica, this time for a different style of prayer. I found there a place to pray when I was exhausted and felt unheard, so it made sense to go back when I was grateful and filled with hope. I was honest with God before in my pain and confusion, and honest with God again in amazement and joy. I minister with the hope that our students will do the same and find faith in the constancy of God’s love, particularly in the way it is revealed to us through the Mass. I returned to campus after spring break with a sense that I had been gone for a very long time. I was on tour with the Glee Club and as we traveled through the American Southwest (enjoying every moment of it) I was left with very little time to pray. During the day we were either exploring a city or on the bus, and anyone who has been on such a bus for an extended period of time knows that it isn’t the best place for silent reflection or prayer. It is noisy and busy and exhausting. In the evening we would have a concert, visit with those who were hosting us, and then promptly collapse exhausted into sleep. Overall it was a week that did not lend itself to a consistent prayer life. And I felt it. When I returned I knew that I needed to pick up where I left off. I knew that I should go to Adoration in the CoMo chapel, or at least set aside some time to pray and center myself back into an awareness of God. The problem is that I really didn’t want to. I felt just a little bit lost and something kept convincing me to go do other things. This continued on for a week where some voice kept calling me to prayer but I kept myself away. Eventually, I made my way into a chapel by overriding strong hesitation and forcing myself to make an effort. I sat down and began to pray. I knew that something was different. I felt foreign and distant from my prayer. It was like seeing a very old friend again and not knowing what to say because there is simply too much to say. I didn’t know whether I should apologize for my absence or be angry that God didn’t do more to pull me in sooner. It was in that chapel, in that moment of ambiguity in prayer, that I realized something remarkable. God didn’t feel distant from me. He felt as close as ever. I looked back across this week of hesitation and I realized that God had been pulling on my sleeve, flicking my ear, and reminding me constantly that I should be praying. At the time I thought it was just annoying. I was angry with God for not calling me back to prayer while at the same time I was annoyed that a little voice in my head wouldn’t let me just go my own way in peace. I didn’t realize until later that God was that little voice. I realized that I had been talking to God all week. I had been telling him: “I know that I should be praying, but just give me a day or two.” I asked God to wait for me, that I would be back soon. God did wait for me. He was there waiting to hear everything I had to say or to sit with me in silence whenever I was ready. But God wasn’t going to just let me wallow until I happened to find my way back. He was constantly pulling and calling out to me. He told me time and time again that I would find joy in coming to Him. I couldn’t find my way back to prayer except through prayer. Only God could be the source of a relationship with God. I wasn’t going to find that through ignoring him. I have often had long periods of time where I cannot hear God or it seems as though God cannot hear me, and I know that I am not unique in this. In these moments we are filled with the temptation to run and hide. We think that wherever God is he doesn’t want to hear about our problems. He’s probably angry with us and we need to fix things before presenting ourselves before Him again. The beauty is that God, whether we feel close to Him or not, is always with us. He is always calling us to Himself. We hide ourselves from Him and dress Him up in all sorts of disguises so that we may ignore his call for a moment. But God does not ignore us, even for a moment. He hears us and sees us in every moment of our lives. He waits for us to hear His call so that He may welcome us with open arms into the joy of His love. In a little over a month I will be leaving Notre Dame and I know that I will encounter more “tour bus times”, those periods when prayer is neglected for a while. I know that I can take hope in the fact that God will always be calling me back to him and waiting for me with open arms. Unfortunately, my lack of discipline tends to spill into other parts of my life, like not exercising and, more importantly, not devoting myself to regular prayer. I know that conversing with God on a regular basis is a good thing to do. It’s easy for me to connect the most joyful and peaceful times in my life with those times when I had the most consistent prayer life. That is why I find it so frustrating that I struggle time and time again to have ongoing conversations with God. Now I know this is easier said than done. With the steady flow of exams and projects, extracurricular activities, and the ever-present stress involved with finding an answer to the “what are your plans for next year?” question, it is definitely difficult to find time to hit pause on the day and just sit with the Lord for a few moments. Something that has always helped me with my struggle is being part of a supportive Christian community. This is why I am so glad I chose to come to a school where the opportunities for being a part of such communities are plentiful. From my dorm brotherhood in Fisher Hall, to the Compass groups I lead, to the Notre Dame Vision mentor community, and the friends I have through Campus Ministry, I have been able to connect with individuals who challenge me to strengthen my connection to the living God through prayer. For someone like myself who often struggles with having the discipline to develop my own prayer routine, it is a blessing to have the encouragement of others that share the common goal of growing in faith. The point of this meandering blog is to say that in my desire to become a more disciplined person of prayer, I don’t need to rely wholly on myself. I should continue to draw strength from others, so that I can, in turn, provide strength for them.